We drove into Edmond to the Walmart store for a few more groceries on a warm Monday, June 11th. We noticed the Cedar Valley RV Park was almost full. A lot of large motorhomes had moved in the previous afternoon and evening. We got a call from our oldest son, AJ and he was excited, because he was going to see Trey in concert. Trey is also known as Hank 3 and Hank Williams III. His birth name was Shelton Hank Williams. AJ loves everything music related and going to concerts was a real treat for him. 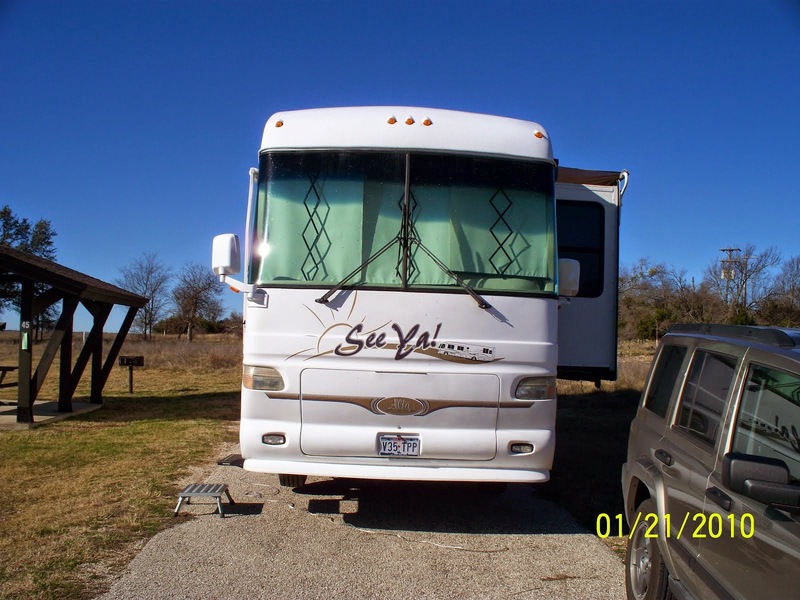 The RV park is actually about 5 miles west on Guthrie on OK 33. Tuesday we drove into Guthrie to look around. Kathi enjoyed showing me sites she remembered – remember she left Guthrie when she was five, but visited many times and seemed to remember a lot of things about the town, even though much of it looked different to her. Kathi got a call from her mother who told her they might not come to the reunion, because their dog was sick. She did find out her brother Larry Clark and his wife Andrea would be at the reunion whether her mother came or not. We found a Cracker Barrel for lunch. I had a bacon cheeseburger and Kathi had baked chicken and dressing. The meal was great as usual. I even had part of my burger and fries to take home for later. Rain on Wednesday kept us inside most of the day. 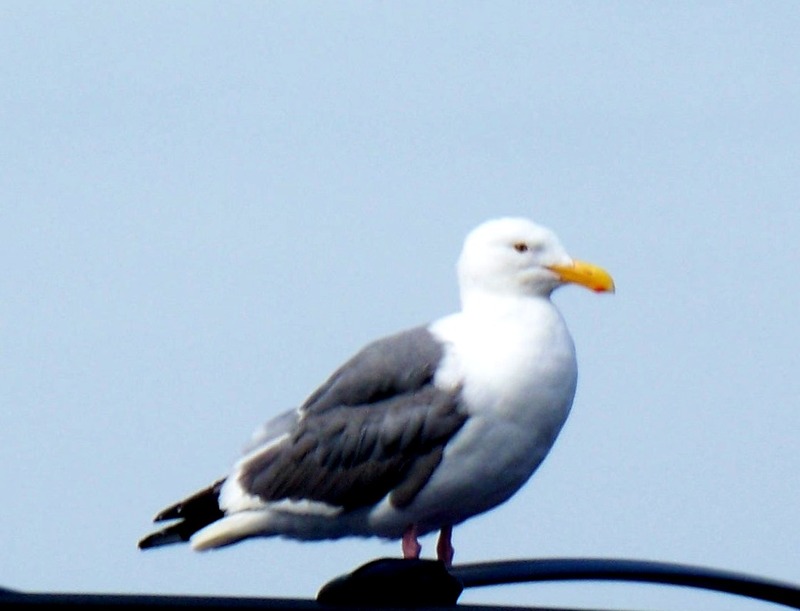 On Thursday, Larry, Andrea and Kathi’s mother, Virginia Hathaway (Ginny) arrived in town. Jim stayed home with the sick dog. Kathi and I met the three of them for lunch at Cracker Barrel, where we spent more time visiting than eating. After lunch we drove to Kathi’s older brother’s house to visit with Carl and Cheryn. We picked up Ginny, Larry and Andrea on Friday for another tour of Guthrie. Ginny knew a lot more about the town than Kathi remembered and she wanted to see some of the things she remembered from 50 years earlier. We drove around on country roads trying to find the small cemetery where Ginny’s parents were buried, but we never could find it. We gave up after looking for about two hours. We had lunch at On the Border in Edmond, then took Ginny back to Carl’s house so she could rest. 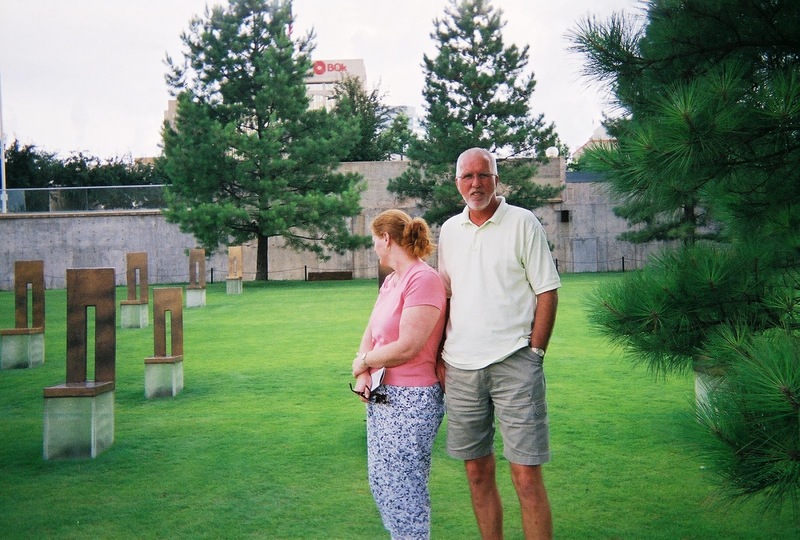 Larry, Andrea, Kathi and I drove into Oklahoma City to visit the Federal Building Memorial. Kathi and I thought it was a moving experience when we saw it the previous week and we wanted to share the experience. It was just as moving the second time around. 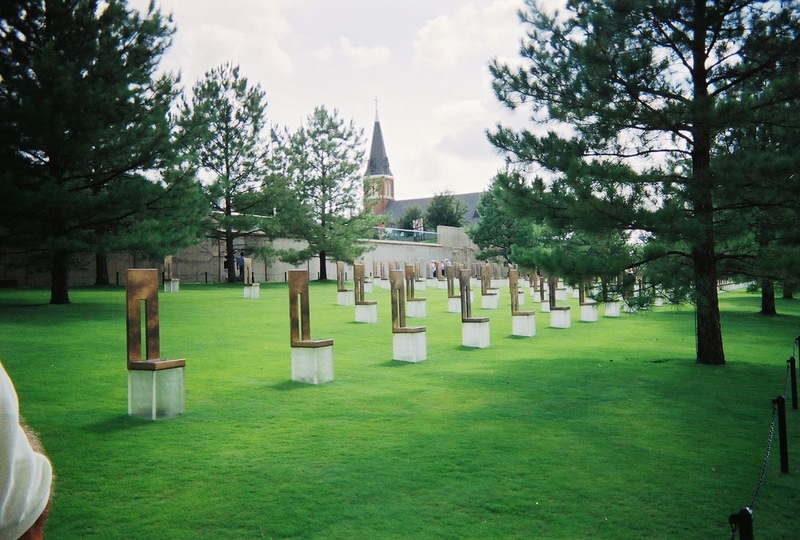 Park features include the Gates of Time, The Survivor Tree, a reflecting pool, the field of empty chairs and others. The east gate marked 9:01 represents the peace before the explosion and the west gate marked 9:03 represents the time recovery began. The reflecting pool is less than ½ “ deep and the water flows across it constantly. 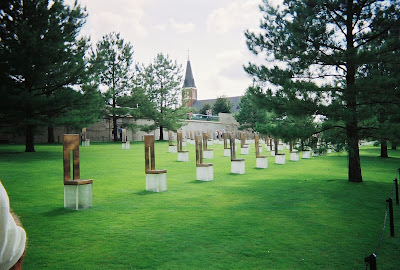 The pictures show some of the field of empty chairs. This was great to read. I was living too far away to make the family reunion but I will Facebook comment a quick story I have about this one.